SECTION 605 – MEMBERSHIP APPLICATION – Any person eligible for membership in the Marine Corps League under the provisions of the National Bylaws and Administrative Procedures of the Marine Corps League may initiate application for membership by completing a standard application form to include the signature, and presenting the application to a sponsoring member of the League with all required dues and fees. Also to provide for viewing by the Detachment Adjutant or Commandant a certified true copy of the applicants most current DD214. 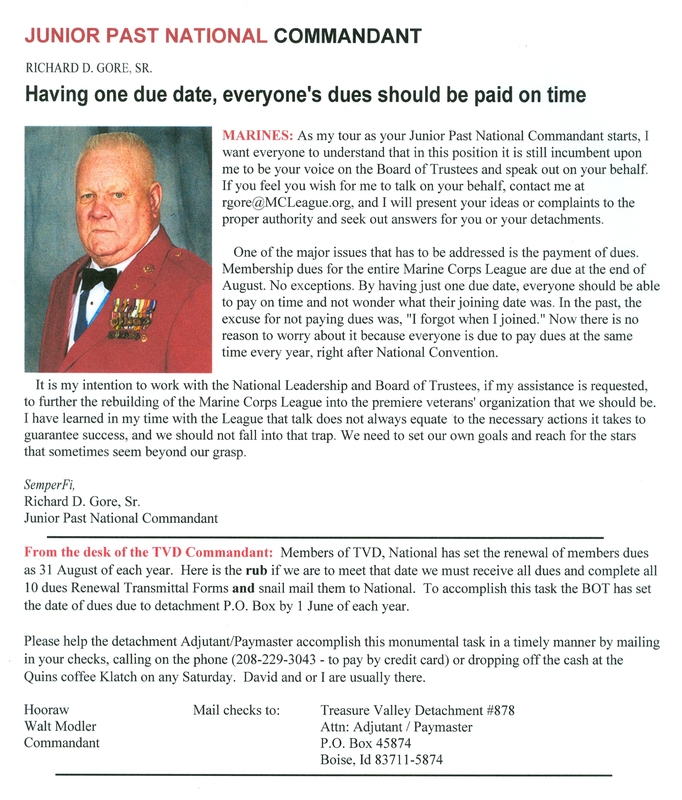 SECTION 610 – MEMBERSHIP DUES AND FEES – The payment of annual National membership dues entitles all members in good standing an automatic subscription to the Marine Corps League publication, and enrollment privileges in any National Group Insurance Programs that may be in effect. SECTI0N 620 – DELINQUENT MEMBER – A member shall be identified as delinquent whenever the member’s dues are not paid and transmitted on or before membership expiration date; as shown on member’s card. SECTION 645 – LIFE MEMBERS – Regular or Associate Members of the Marine Corps League who are in good standing (as defined in Section 615 – GOOD STANDING- All members shall be considered in good standing in the Marine Corps League, (a) Except when: (1) Required dues are not paid, and transmitted, on or before expiration date as is shown on the member’s card.) may become a LIFE MEMBER, upon proper payment of the fee, as is required herein. A LIFE MEMBER shall be subject to the payment of NO further dues to a Detachment, Department, or National. Such member shall have all the privileges, rights, and benefits enjoyed as a member so long as that LIFE MEMBER shall live. Should a Marine Corps League member choose to become a member in multiple Detachments, they must become a member in good standing by paying Annual or Life, Membership dues in each additional Detachment. The Life Membership fee shall be as established by the National Convention. such fee is paid by the individual or awarded by a Department or Detachment.